Synopsis: A resurgence of Trinitarian interest gained momentum in the twentieth century and it is showing little sign of abating in the twenty-first century. 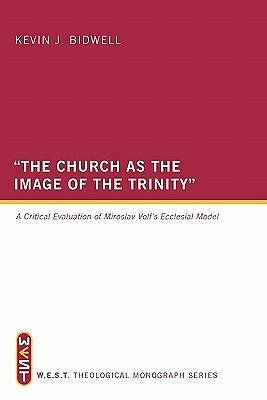 This research endeavors to critically evaluate Miroslav Volf's ecclesial model for "the church as the image of the Trinity," one that he presents with the English title, After Our Likeness. Volf proposes a social doctrine of the Trinity, one that is heavily influenced by the theological writings of Jurgen Moltmann, and he puts forward that this nonhierarchical Trinity should be reflected in the structures and theology of the church. If Volf is correct, then a radical reshaping is needed for the church to conform to an egalitarian pattern, one that is "after the likeness" (Gen 1:26) of an egalitarian God. In this critical examination, Kevin J. Bidwell begins by stating the theological influences that are pertinent to Volf's thesis in After Our Likeness and the assumptions that undergird and inform his whole theological paradigm. An important theological excursus is offered to assess the theology of John Smyth, the first English Baptist, who is Volf's representative figure for the location of his own ecclesiology, the Free Church. A critical analysis follows of Volf's engagement with his two chosen dialogue partners who represent both Western and Eastern theological traditions: Joseph Ratzinger and John D. Zizioulas. Volf presents five theses for "the church as the image of the Trinity," which could be labeled as Volf's Free Church in the image of Volf's revised doctrine of the Trinity. This monograph offers extensive insight into the contemporary debate on the doctrine of the Trinity, but it also assesses many aspects of ecclesiology from both Eastern and Western perspectives. Endorsements: "Miroslav Volf has had a profound impact on contemporary discussions on the doctrine of the Trinity, and its significance for contemporary ecclesiology. Kevin Bidwell's book provides the first comprehensive evaluation of his approach to these topics, which impresses by his unbiased critical discussion of Volf's ecclesiological egalitarianism." -Johannes Hoff Lecturer in Systematic Theology & Philosophy University of Wales: Trinity Saint David "This book by Kevin Bidwell represents a major, original contribution to contemporary Trinitarian theology. His contribution lies in a critical engagement with Miroslav Volf's social understanding of the Trinity, Moltmann's influence on Volf, the adaptation of the early Separatist writings of John Smyth by Volf, and his development of an egalitarian ecclesiology. This is research at its best and must be read by church ministers and academics." -Eryl Davies Principal Emeritus Wales Evangelical School of Theology "Miroslav Volf argues cogently for a social doctrine of the Trinity and for an egalitarianism in both the Trinity and the church--ideas which are very popular today. He also claims that his ecclesiology flows from his doctrine of the Trinity. Kevin Bidwell subjects these claims to a penetrating criticism, and all who hold to them need to listen carefully to what this book has to say." -Tony Lane Professor of Historical Theology London School of Theology Author Biography: Kevin J. Bidwell is the minister of Sheffield Presbyterian Church (a church plant with the Evangelical Presbyterian Church in England and Wales). He has completed doctoral research with the University of Wales: Trinity Saint David."